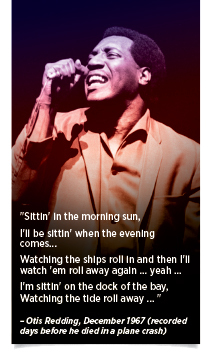 Otis Redding’s biography doesn’t include his talents as a clairvoyant, but this whimsical slice of life reminds us that right now your team likely includes some wonderful people who are watching the tide roll away. Guess what? They’re also collecting a paycheck. Slackers exist in most sectors of our economy: public, private and nonprofit. Many studies have been conducted by organizational behavior specialists about who they are, how they morph into agencies and organizations, and how they survive under the radar of management. Their cost to your business can be enormous. As part of a recent research project on behalf of an insurance company, nearly 30 agency managers were brutally honest when they were asked to evaluate those employees who watch the tide and those who challenge to sail the tide. Here is what they said. The consensus is that the cost of a new hire in the life and health insurance industry can exceed $70,000 when one considers recruiting, screening, onboarding, and a minimum of six months of effort and expenses. Some agency leaders acknowledge that their mid- to lower-level performers are retained because of an innate fear that the talent pool to replace these folks could be weaker. What? Consider all the returning military veterans who are great patriots, talented, fierce in their devotion to duty. I’d consider them to be priority candidates to become licensed and to sell the very products that insure life because they placed their own lives on the line in the defense of others. Then consider those whose careers were derailed merely because the companies they worked for could not weather the storms in the marketplace. Although these employees may have had exceptional talent and performance, their companies’ leadership stunk. Find those ex-employees. They are looking to join your organization – now. Finally, our interviews with various general agents reflected remarkable honesty about a sensitive issue: Sometimes the biggest slackers may be our sons and daughters. Sure, we love them. They were so adorable as kids. We also sometimes recognize that the likelihood of their finding a sizzling career elsewhere is moderate at best. In other cases, we see real opportunity for success, and we are right – the next generation is stronger than we are, more astute in building client relationships. But for many, the phones are answered and the back room is managed by – well – underachievers. In these cases, love is not only blind, it’s also expensive. Three agency managers acknowledged that they rarely if ever tell clients that Janet at the front desk or Manuel in claims processing is a family member. There may be incredibly good reasons to mask that information, but I’m still scratching my head about why you wouldn’t want to celebrate a family-owned, family-driven, successful agency. That’s the pride of a community and what so many seek to achieve. Beware of those who allow their kids to “watch the bay,” escaping accountability. And shame on them for not driving each person in the organization to be accountable and help the clients who need our products and insight more than ever.